Chinese shipping firms are evading sanctions against North Korea registering ships in third countries. Ships owned by Chinese firms that were seized in Yeosu and Pyeongtaek ports late last year for violating UN Security Council sanctions had all been registered in third countries. These ships often entered South Korean ports, while some were even registered as South Korean. The oil tanker Koti, seized in Pyeongtaek-Dangjin port last month for handing over oil to North Korean ships, was a Panamanian flag vessel but had been registered in Malaysia until the first half of last year. Once it started flying the Panamanian flag around June, the Koti's operating range shifted from Indonesia and Singapore to the Korean Peninsula. According to Asia-Pacific shipping records, it belongs to a company based in Dalian, China. Data from vessel-tracking service FleetMon shows that the oil tanker Lighthouse Winmore, which was seized after docking in Yeosu in November, was registered in the Marshall Islands. The situation is similar for six other ships that have been caught by the U.S. for violating the sanctions. The Kai Xiang, which actually belongs to a company in China's Shandong Province, had been registered in Panama until the U.S. turned to the UN last month to stop it and now sails under the flag of Sierra Leone. It seems the ship is avoiding being blacklisted by the UN and continues to sail under changing names with Chinese protection. The Yu Yuan, another ship nabbed by U.S. intelligence after exporting North Korean coal to Russia last August, is registered in Togo but was registered in Cambodia until the first half of last year. And the Orient Shenyu changed flags twice over the last two years, switching from Fiji to Sierra Leone and Panama. The Xin Sheng Hai, which the U.S. also suspects of violating sanctions, was registered in South Korea until the first half of last year, but since a Chinese shipping company bought it in June it has been flying the flag of Belize. These ships regularly enter South Korean ports after changing their flags, especially Yeosu port, which is a hub for oil tankers. 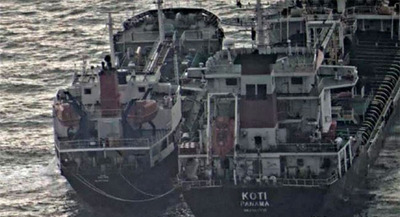 Since being registered in Panama, the Koti docked frequently in South Korean ports. From August to December last year, it docked in Yeosu port six times and three times in Pyeongtaek-Dangjin port. On eight of those trips it was to be loaded with oil cargo. Billions No. 18, another ship blacklisted by the UN, docked in Yeosu 27 times last year alone. It is unclear whether the ships violate UN sanctions each time they dock in Yeosu. But the Lighthouse Winmore, which was seized at Yeosu, had been captured on camera supplying oil to a North Korean ship called Samjong No. 2 on the high seas after being loaded with oil in Yeosu. The other two oil tankers may have engaged in the same illegal activities. The Shinsung High, which was once registered in South Korea, was bought by a Chinese shipping company and began sailing under the flag of Belize during the second half of 2017. Since then, it has docked in Incheon, Yeocheon, Busan and Pohang. A Foreign Ministry official said, "Ships that want to trade with North Korea in defiance of UN sanctions may be using South Korean ports. We continue to monitor such activities."